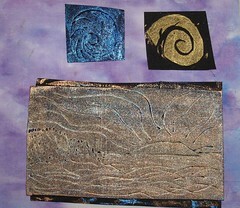 I’ve been fooling around with stamps a bit more and have stared playing with sheets of thin foam. Its great to work with and easy to cut into stamps. It can also be used to make printing blocks in the same way as meat trays; it can be engraved with a ballpoint pen. 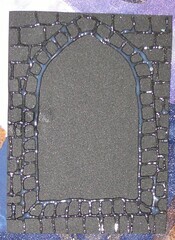 An assortment of impressions and a meat tray foam block. The foam can be cut quite finely. I made this “B” stamp to be used on the first page of a book I’m working on. It’ll be the “B” in “Beatus”, the first word in medieval books of Psalms. The plan is to stitch details and add more substance, but I like the feeling of the paint on fabric of this piece. 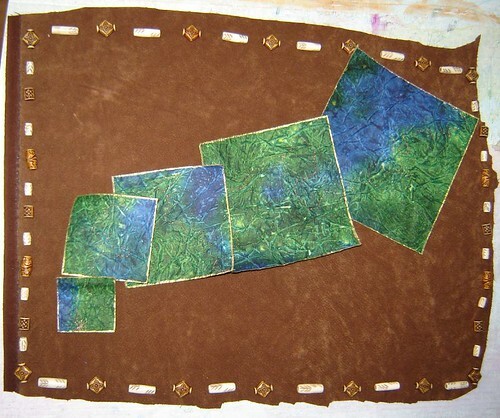 On a final note, I’m working on a piece using paper on leather and have been playing with a beaded border. I actually think I’m going to work the beads along the binding. So far it’s not bad, but there’s still lots to be done. The brown space that still exists on the piece will be embellished in various ways hitherto undecided and I plan to cut away a few holes and have other images show through. It’s a work in progress…. Previous Post In case you were wondering where I work…. I think you’re really on to something here. 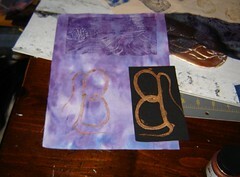 I particularly like the little embossed bronze looking piece…almost like jewelry. Who knew styrofoam could have such uses! Keep it up! Pingback: Gone to the Dogs » More possibilities with foam, glue and paint….